This cat looks like he is home for the evening and nothing is going to disturb her during her slipper time. When you own kittens, it is important to remember to check your slippers and shoes before you put them on (for various reasons). Sometimes you just have to take the world on, one novelty slipper at a time. To a cat, a slipper can be a play-toy, a bed and sadly even a toilet! 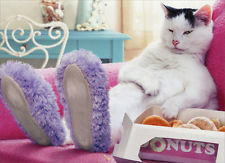 Seems this kitty might want to get a few sizes smaller the next time he goes slipper shopping. What cats are still small a comfortable, fluffy slipper makes a great cat bed! Catching your cat wearing your slippers is a lot better than catching them pooping in them! This puss stomps around all day like he owns the place! But with feet, that big no-one is going to argue with him. This kitty doesn’t approve of your choice in open-toed slippers. But wears them anyway to keep his legs warm. It’s Dinoclaws! He stops about all day long in his novelty slippers, pretending to stomp on the poor, tormented dog.